Vehicle traffic will not be allowed to enter Elk Grove Regional Park after 8:30 pm due to the fireworks show. East Stockton Blvd. at Valley Oak Lane will be closed to all southbound traffic except for emergency vehicles or transit buses. East Stockton Blvd. at Elk Grove Florin Rd. will be closed to all northbound traffic except for emergency vehicles or transit buses. Elk Grove Blvd. exit from northbound Highway 99 will be closed temporarily after the fireworks show. Southbound East Stockton Blvd. at Elk Grove Blvd. will be closed to all traffic except for emergency vehicles or transit buses. Southbound Elk Grove Florin Rd. at Elk Grove Blvd. will be closed to all traffic except for emergency vehicles or transit buses. 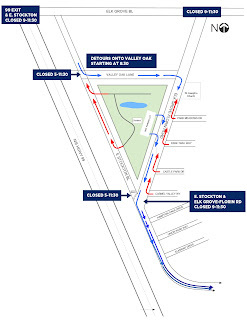 Residential traffic to the east of Elk Grove Regional Park will only be able to exit the area by making a right turn onto northbound Elk Grove-Florin Rd. towards Bond Rd. All southbound traffic on Elk Grove-Florin Rd. will be diverted westbound onto Valley Oak Lane. All northbound traffic on Elk Grove Florin Rd. will continue northbound past Elk Grove Blvd. and continue towards Bond Rd. Traffic leaving from the eastside of Elk Grove Regional Park will only be able to turn right onto southbound Elk Grove-Florin Rd. Traffic will then be directed to southbound E. Stockton Blvd. then to either Highway 99 or Grant Line Rd. 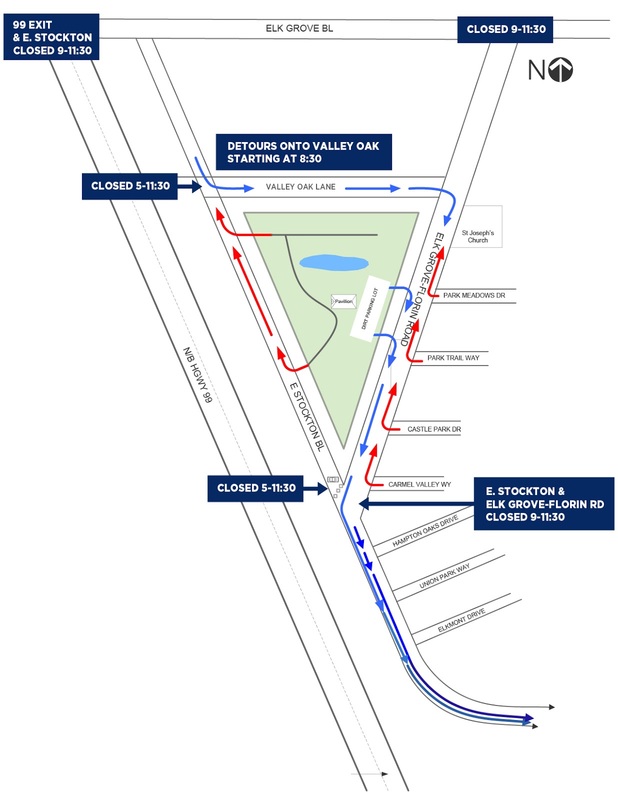 Traffic leaving from the west side of Elk Grove Regional Park and westbound on Valley Oak Lane will only be able to turn right onto northbound E. Stockton Blvd. which will lead to Elk Grove Blvd. or the new Highway 99 onramp. Traffic leaving on Valley Oak Lane (east or west) will be allowed access to northbound Elk Grove-Florin Road, northbound E. Stockton Blvd. or northbound Emerald Oak. Traffic exiting from the area of Hampton Oaks Drive, Union Park Way or Elkmont Drive will be directed onto southbound E. Stockton Blvd. towards Grant Line Rd.